I have been feverishly working on my 5 additional pieces Somerset wants for the August issue. It is so exciting for me, but I still can’t believe I will be their guest artist! I guess I won’t believe it until I hold the issue in my own hands! Anyhow, I have been working non-stop and I am liking how my pieces are coming along. In the middle of it all I did another girl portrait. I’m still trying to get the face down and I really want to find a style that is “me”. I just figure I will keep working at it until I am totally satisfied. 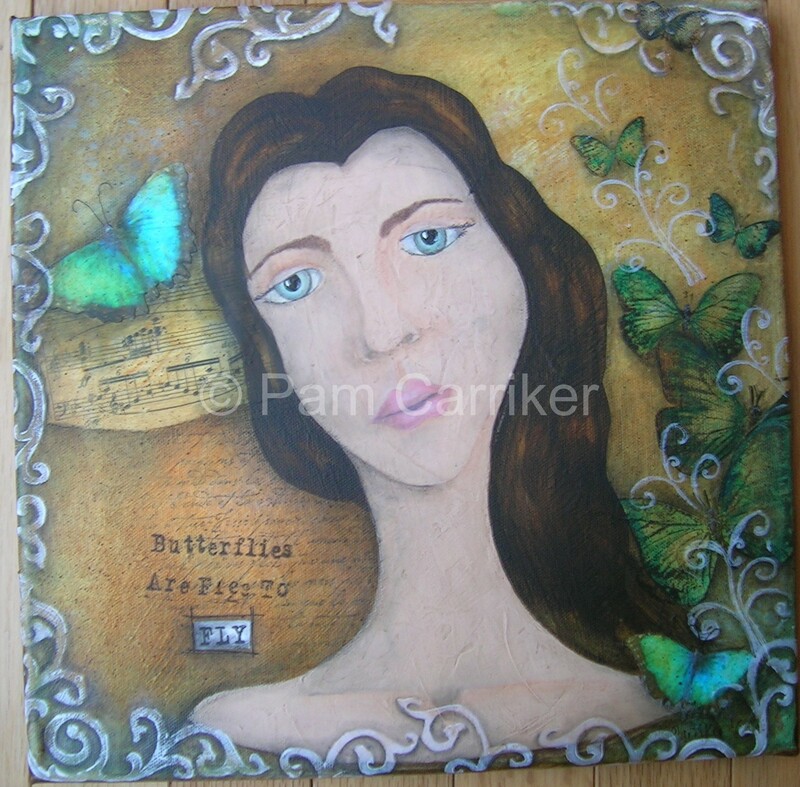 I do like the butterflies in the background of this one and I like her eyes. She looks sad. I used molding paste for the base of the face and neck. It works ok, but I think I like working on a smoother base. I wish I could share the things I working on for the mag, but that will have to wait. You’ll have to get a copy of it when it comes out! Love your portraits! I’ve been working on portraits too and taking Paulette’s online backgrounds and portrait classes. You definitely have a head start with your art background! I’m pretty much a blank slate when it comes to drawing and painting.